When friends recommend movies I shush them. Because no one—least of all me—can recommend a movie without launching into what it is, exactly, that makes the movie worth seeing. And I don’t want to know! I don’t! I want to discover the movie’s gifts for myself, second-to-second, as I watch. “It’s about a woman who—” Shush! “And there’s this scene when she—” Shush I said! Same for books. I never read book jackets because I want to discover a story, a novel, a memoir just as the author wants me to receive it—word-by-carefully-selected-word. Now that you know that about me, you’ll understand why I’m finding it so hard to write this review. Because to tell you what I love about this story I have to exalt—oh, dear—the story’s final line. Whenever a reviewer savors a magnificent sentence from the text in question, said reviewer is supposed to share the quote. But in this case, dear reader, to explain why I believe “Housewifely Arts” by Megan Mayhew Bergman is worthy of the label “best of 2011,” I would have to bonk you over the head with its ending. I would have to write, in earnest, those awful words: “Spoiler Alert.” And I just can’t do it. Well… wait. Just wait a minute. Actually, I think I could. I just looked at the sentence again and I’m realizing that quoting it probably wouldn’t spoil the story for you at all. Because context-free, the line is a very nice line indeed, but it doesn’t, as a small collection of words alone, do anything much. If I were to right now type out that last line, it would, I know, fall lightly on the page—unobtrusive, entirely harmless, taking only the space allotted. With the tap of each fingertip I could push the words and spaces and punctuation gently into place… affecting exactly no one and no thing. Which, now that I think about it, is the real reason I can’t quote it. If I extract that line from its rightful place I’ll rob it of its power. I won’t do it. But oh that last sentence! That one small string of words carries the entire accumulated weight of the story, and I would so dearly love to examine how each word shoulders its share of the burden. Maybe it wouldn’t do any harm if I… probably you don’t care…? No. There’s no hope for it—I can’t quote the most quotable sentence of this story. So I’ll rely on another tool of the reviewer: comparisons. Let’s talk about endings. If you haven’t read Chekhov’s “Gusev,” find it NOW and feast on one of the best endings of all time: two paragraphs of splendor. “CivilWarLand in Bad Decline” and “Pastoralia,” my two favorite George Saunders tales, pound you with abject hopelessness—delicious in its purity—in their final lines. I had to re-read several times the last paragraph of Joyce Carol Oates’s “Where Are You Going, Where Have You Been” before I could admit that, yes, that was the ending, and that awful hole in my stomach was blasted by a short story. In “Bullet in the Brain”—Tobias Wolff’s few pages of genius—behold a final paragraph that captures the weight of a life. And go ahead, read again Tim O’Brien’s “The Things They Carried,” meditate on those last few sentences—talk about a hole in my stomach. All to say… we are no strangers to the magnificent ending, you and I. Every wonderful story has one. But also to say: note the plural that lurks in every reference I just made. 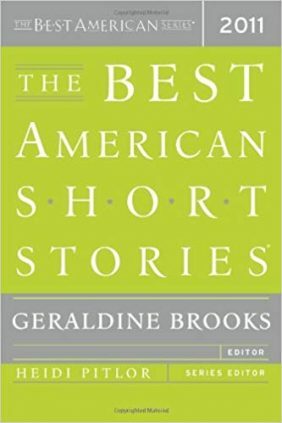 Two paragraphs, final lines, last/final paragraph, those last sentences—in mentioning the ending to each of a handful of my favorite stories, I refer to more than one sentence because it takes more than a sentence to deliver an ending to a short story. Even with a very short fiction, one can’t wrap it up properly—deliver the required emotional punch, stamp the character as transformed or revealed, provide (or brazenly deny) closure, justify every word that has come before—in a single sentence. Except here. In “Housewifely Arts.” With the sentence I can’t quote. I am my own housewife, my own breadwinner. I make lunches and change light bulbs. I kiss bruises and kill copperheads from the backyard creek with a steel hoe. I change sheets and the oil in my car. I can make a pie crust and exterminate humpback crickets in the crawlspace with a homemade glue board, though not at the same time. I like to compliment myself on these things, because there’s no one else around to do it. There’s your proof that Bergman can write. But know: if you receive this story as I did, your gratification will be delayed. I was never bored. But neither was I wowed, really, as I paged through this story, after that first paragraph. This is very nice sentence-level writing, I thought, as expected. These characters are different enough to be interesting, sure. But as I read on, the story began to drift away. I felt I’d been promised a stand-off early on that doesn’t develop when the characters meet. The story began to feel a little long. The climax was… underwhelming. I’d hoped for a bit more noise for so much space, some heat. Mind you, all along I found the story perfectly competent, entirely pleasant, well-constructed, nicely paced. And so much competence without any risk or disruption was maybe a problem, I thought, as I read the last (very short) page, basically unmoved but comfortable enough, feeling reasonably entertained. Then I hit that last sentence. And that’s when every word of the story was justified and I was grateful for this book and all the people responsible for giving this story space and light. I gave you the first paragraph, but that’s it, no more previews. I’ve been shushed. Go read “Housewifely Arts” just as Megan Mayhew Bergman wants you to receive it—word-by-carefully-selected-word—and marvel at how one final sentence can transform a story from admirably competent to sublime.